I'm not sure whether I read it in the Zip build instructions or in the BBWP book but that's what I intend to do. Around the motor mount (aft of frame 1) the keel will be somewhere between 6" and 8" wide, laminated to double thickness with solid timber. But forward of there I'll laminate with ply. One thing I'm not entirely clear on is whether it's normal to laminate only between frames (after attaching the keel) or to increase the keel notches in the frames by 1/4" and run the lamination full length in one piece (before attaching the keel). The latter would be stronger but it would have to stop at frame 4 otherwise the keel would likely be too stiff to bend up to meet the stem. Forward of frame 4 I guess it'll need the ply bonding on afterwards anyway. Mine is a full-length lamination of 3/8 ply and I have a pretty good bend from frame 4 over frame 5 to where the keel sits in the stem. I don't recall it being too much of a problem bending it in. If you start attaching from the front then you have plenty of leverage as you go back. Laminating the keel between the frames after the flip would probably be okay too but it's probably easier to do it on the bench before installation. Keep the nails towards the center of the keel so that when you go to fair the keel you won't get into the hardware. hoodman wrote: Keep the nails towards the center of the keel so that when you go to fair the keel you won't get into the hardware. Good tip - I had in mind to just bond the ply to the keel but nailing it probably makes sense. Yeah, bonding is the idea but you'd need about a hundred clamps. Ring shank boat nails make this type of thing super easy and they REALLY hold tight. The scores are in. 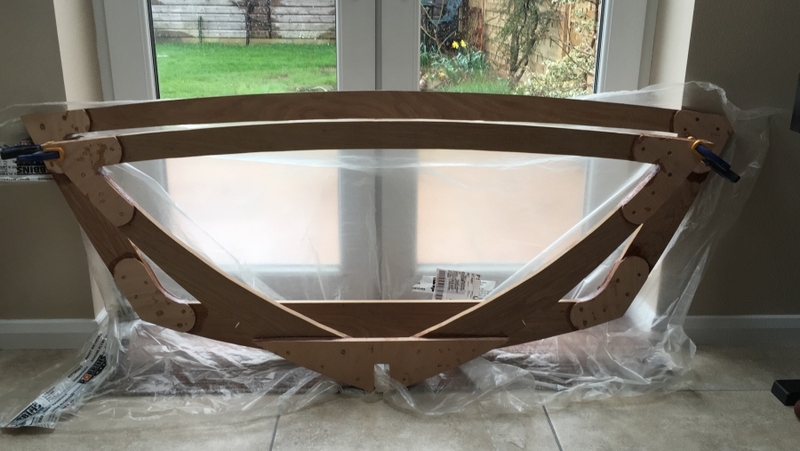 An order of mainly utile (sipo) but with some douglas fir for the transom formers and some WRC for a canoe project comes to £863 including tax. The entire order in yellow cedar (slightly more board feet due to different board sizes) comes out at £661. So quite a difference, and I believe I'm comparing very good quality yellow cedar with average quality utile. 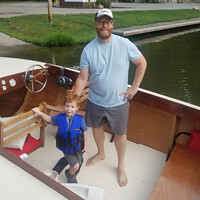 While my heart tells me utile because in my mind "it's mahogany" and it's "right" for the style of boat, my head says cedar because it's probably better to work with, quite aside from the price difference. And it won't even be visible in the finished boat. So I think I've made my decision. And it's yellow. The frames are now all epoxied and the chine and sheer notches cut. Frames 5 1/2 and 4 curing in the house because it's cold in the garage. Other than cleaning up the stray epoxy they are now ready to go on the build form, for which I've just ordered timber. The stem and breasthook are modified to allow a rounded bow profile. Frame 5 1/2 is standard, frame 4 has a regular deck beam instead of a dash profile because I don't want the dash to be dependent upon the frame. There will be a half frame 3 but that won't be added until later. Frame 2 has temporary MDF side sections because I need to determine its final shape by eye once the frames are mounted. There's a half frame 1 (not shown) and then the transom. I've decided to bond the breasthook to the stem without screws, but to wait to do that upside down on the build form when getting accurate alignment will be easier. I would encapsulate the frames now. Bill, I thought about doing that but there are so many aspects that are subject to change that I wondered whether it was worth doing now. Maybe I'll compromise and encapsulate the forward two frames and stem (where access afterwards is probably most difficult and change is less likely) and then leave the rest until a bit later. At least until I've got the whole of frame 2 in oak and the side battens done. Is 2 coats of epoxy the accepted standard for frame encapsulation? Your frames look great, good to be started. I hear you. I am making a few modifications too and I didn't want epoxy to get in the way... plus I could not wait to get on with it...and no epoxy experience...so I did not encapsulate. I set the frames, chines, and shear, notched for battens, test fit the battens. Then I encapsulated. Rather than do the frames flat, I did them in place, so the stuff could run. Rather than do them in easy reach, I stretched across the chines while the shear bit my shins. It might be better if the frames are a little farther apart, mine are at two feet, just right for getting fresh epoxy on me from the just done frame while starting on the next one. The epoxy got in some of the batten notches and had to be cleaned out with with chisel and sand paper. Ugh, what a mess, encapsulate now. Next time I will encapsulate, three coats, and touch-up the runs, scuffs and scratches later. OK, Tom, you've convinced me My frame spacing is 26 inches so not very different from yours - an equal lack of space to move around. Sounds like a job to start this evening before I dismantle my large work table later in the week to make space for the build form. The worst part after the flip is encapsulating everything inside the hull. The more you can do ahead of time the better. Not all that timber is for the build form - I also need to build a cycle store to get the bikes out of the garage both to create more space and to keep them out of the dust. I'll add 4" more frame to this (1" overlap plus the extra 3"), laminate the inner side of the entire lower frame with 1/4" ply to reinforce the join and then use 3 knees (normal one onto the keel plus one onto a batten each side) to add further strength/stiffness, bridging the joint in the lower frame. I don't think it'll be a significant weakness once it's all together. I understand the space problem. I think many of us here do!! I placed mine nose in the garage so I would have better access to the transom, but it was a real bear getting the forward skins on at that time. I have approximately 1 " to spare in the back of the garage and 2 inches at the door. I almost always work with the garage door open. Looking good so far. Don't worry about progress. Just make a point of doing something everyday, even if its only 15 minutes worth. Its still progress.